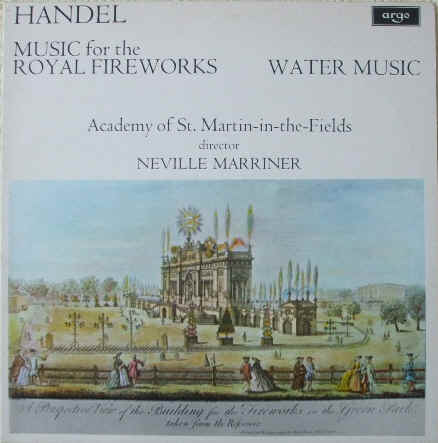 33rpm LP Record, featuring the Academy of St Martin-in-the-Fields directed by Neville Marriner. It was issued on the stereo ARGO rectangle label in 1972. 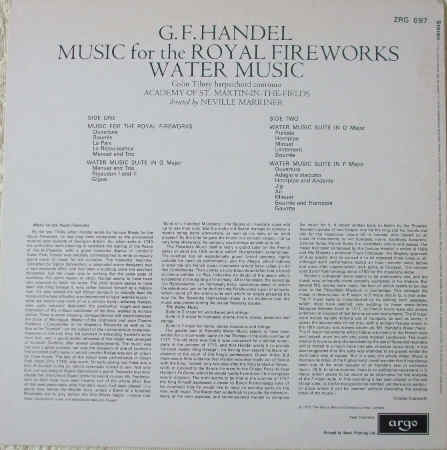 On offer here is a 33rpm LP Record of ZRG 697 - HANDEL: MUSIC FOR THE ROYAL FIREWORKS & WATER MUSIC, featuring the Academy of St Martin-in-the-Fields directed by Neville Marriner. Also featured is Colin Tilney on harpsichord continuo. It was issued on the ARGO rectangle label in 1972. The record itself is in better than excellent condition, with hardly a mark on the surface (viewed under normal house lighting). Superb sound quality, with NO jumps, pops, ticks or background crackle. Minimal to no spindle wear. Labels very clean, no discernible spider marks. The sleeve and original DECCA inner sleeve are also in better than excellent condition, with no wear to speak of. Overall, a near pristine item, with very high playback quality.